Most meals are served with some form of carbs – rice, noodles, potatoes or bread. In order to make strides toward your fitness goal, it’s a good idea to eat fewer carbs at dinner. 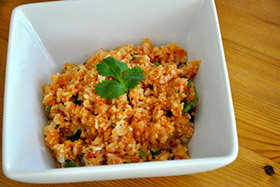 This recipe for cauliflower rice is a great way to still enjoy a side of rice without sacrificing your results by taking in too many calories and carbs. Preheat the oven to 350 degrees F. Grease shallow baking pan with olive oil. Using a food processor with the grating blade, grate all of the cauliflower. Set aside. In a high speed blender, or food processor, blend the tomatoes, onion, garlic, tomato paste, salt, pepper and tajin until smooth. Mix the tomato blend evenly into the shredded cauliflower. Pour into prepared pan and bake for 20 minutes. Stir and bake for another 20 minutes. Remove from the oven, transfer to serving dish. Mix in the chopped cilantro and drizzle with lime juice. Enjoy! I recently heard a quote that’s worth sharing: Motivation is what gets you started, Habit is what keeps you going. This is very true. When you first start an exercise program you are filled with motivation. It’s what got you into the gym in the first place. It’s what gets you up out of bed and into your workout gear in the morning. But what about when that motivation starts to fade? This is when habit takes the driver’s seat. Let’s face it, you’re not always going to feel incredibly excited about striving after your fitness goals – so on those days when you aren’t looking at the big picture goal allow habit to direct to. Put your healthy eating and regular exercise into habit, and results will find you. I know it’s summer and you have exciting places to go and things to do. But wait! Did you forget about your workout? Again? Lots of people fall off the exercise wagon during summer months due to vacations, taking care of kids home for the summer months, and other warm weather distractions. I get it, I really do, but what about all the amazing perks that you’re missing out on? Just in case you needed a little reminder that will motivate you to lace those shoes back up and get your workout back on, here are 19 Awesome Reasons to Exercise Today! Exercise makes your clothes fit better: Consistent exercise will tone and tighten your body, and this means that your clothes will not only fit better they will also look nicer. But don’t get too attached to your current clothes. Exercise ensures that soon you’ll be trading those current clothes in for smaller sizes. Exercise reduces your stress: Let’s face it, you have enough stress in your life—so take a break. A challenging workout invigorates your muscles and leaves you relaxed and less stressed. Exercise boosts your energy: Research routinely concludes that exercise increases energy levels in sedentary people. So when you’re feeling fatigued, fight it with the most powerful tool available: exercise. Exercise makes you stronger: Who doesn’t want to be stronger? You rely on your body’s muscle strength and endurance throughout each day. With consistent, challenging exercise, your body will naturally become stronger. Exercise burns calories: Extra calories end up stored on your body as fat. Fight back by eliminating loads of calories with fat-blasting workouts. Exercise gives you confidence: Healthy confidence is a wonderful thing to have. By exercising consistently you’re able to increase your natural confidence. Exercise can be fun: Don’t laugh, I’m serious on this one. Whether you believe it or not, exercise can be really enjoyable. Too many people think the only way to exercise is through countless hours at the gym or on a treadmill. Remember how fun it was to run and jump as a child? Tap into your inner child as you find enjoyment in moving your body through any form of exervcise; paddleboarding, cycling, hiking, swimming, softball, etc…are all great exrecises that are also fun. Exercise reduces your blood pressure: Exercise is so powerful that it has been proven more effective than medication in reducing high blood pressure. A single workout has even been shown to reduce blood pressure for the day, and consistent exercise reduces overall blood pressure. Exercise tightens your problem areas: With exercise you can reduce flab on your arms, legs and waistline. So wave goodbye to the jiggles with a consistent, challenging exercise program. Exercise increases your insulin sensitivity: Research continues to prove that exercise dramatically improves insulin sensitivity. Peak after-meal insulin levels have been shown to drop by more than 20 percent after as little as 3 weeks of consistent exercise, whic means less fat storage. Exercise improves your sleep: Exercise is your most powerful sleep aid. Tired muscles encourage your body to quickly fall asleep in order to get overnight repair work done. Exercise lowers your risk of heart disease: Exercise strengthens your heart and protects it against disease. A non-active lifestyle is a huge risk factor for heart disease, so use consistent exercise as your ally against disease. Exercise makes you feel amazing: Challenging exercise releases natural endorphins (happy hormones) into your bloodstream that dissolve pain and anxiety. You’ve probably heard of the ‘runner’s high’, this can be achieved by any great workout. Exercise lowers your risk of diabetes: Research has shown that exercising as little as half an hour each day can dramatically reduce your risk of diabetes. If you are at risk of diabetes, or already have diabetes, use regular exercise as treatment for reversing the disease. Exercise is an opportunity to meet new people:Triathlon teams, bootcamps, workout centers and even jogging trails are all great places to connect with fun new friends. So lace up and put your self out there! Exercise improves your BMI: Maintaining a healthy BMI is key in disease prevention, and exercise is the best way to keep your BMI under control. Exercise increases your endurance: Don’t ever get out of breath from walking up stairs or through the mall again. Your regular exercise builds up endurance for everyday activities. Exercise improves your overall health: Does your doctor give you the lecture about losing weight and exercising more? Once you start exercising regularly you and your MD will see an overall improvement in your health. Exercise makes you look amazing: Are you excited about the current shape and size of your body? If not, no worries. Regular, challenging exercise will work wonders on your physique. Within just a few weeks you’ll start to see shape and tone in all the right places. I hope it goes without saying that I am your go-to point for all things exercise. It’s my passion to see each and every one of my clients reach their fitness goals and improve the quality of their lives. Please call or email today to come in for your free consultation. Together let’s turn this summer into your time of transformation. Just think of how amazing you could be looking after working with me! No more excuses this summer. You have 19 great reasons for getting back to your workouts. I’d like nothing more than to see you attain all of the above 19 benefits of exercise! Avoid eating trigger foods by enjoying wholesome homemade versions of your favorites. 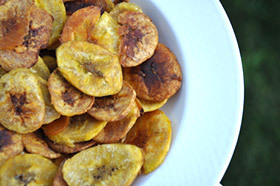 When you have the urge for salty, crunchy snack foods make some of these whole food plantain chips. Cut processed and packaged snack foods completely out of your diet and you’ll find that whole foods snacks like this more than satisfy your snack cravings. Preheat the oven to 350 degrees F. Lightly grease 2 large baking sheets with olive oil. Peel the plantains and slice thinly on a diagonal. In a medium bowl toss the plantains with some olive oil, the juice from 1/2 a lemon and a generous sprinkle of salt. Arrange in a single layer on the prepared baking sheets. Bake for 30 minutes, or until golden and crisp. The cure for your junk food craving is simple…If you don’t eat junk, you won’t crave junk. Decide right here and now that junk food is not worth eating. It makes you gain weight, damages your health, spoils your complexion and causes you to eat far more calories than you need. While the first couple of weeks will be hard, soon you won’t give junk food a second thought. Remember: If you don’t eat junk, you won’t crave junk. Many people who struggle with their weight feel powerless to cravings. Have you ever experienced this? When the urge to eat something bad comes over so strongly that you feel you have no choice but to give in? Then, when it’s over, you feel awful that you’ve eaten all those calories and set yourself up for further weight gain. So you’re good for a couple of days until another craving comes over you…and so the cycle repeats. I’m here to tell you that you hold the power. And it’s not as hard as you think. Most of us have certain trigger foods that send our diets into a fiery tailspin. The plan is to identify your trigger foods and to replace these with more wholesome, real food substitutions in order to break the cycle. Trigger foods are foods that when eaten make you crave more of it, or cause you to eat more food in general. These foods are eaten out of habit, not out of hunger. Your trigger food is something you’ve probably said you feel addicted to. Most trigger foods are high calorie, processed and filled with carbs. You’ll know something is a trigger food when it’s hard for you to stop eating it, even when you feel full. When you stop eating your trigger foods, the craving you feel for it gets weaker and weaker. To assist you through this transition use the ideas below to replace your processed trigger food with a healthier, real food option. Due to the high concentration of refined sugar, candy is one of the most addictive of trigger foods. If candy is a major part of your life, then start replacing it with unsweetened dried fruit. You’d be surprised how satisfying the natural sweetness of dried fruit can be. Try apples, pears, apricots, figs, and mango. Salty snacks are nearly all processed, refined and packed with simple carbs. Basically it’s the perfect storm for weight gain. Fight the urge to rip open a bag of chips and instead make a batch of Baked Plantain Chips. See the recipe below. Sodas made with high fructose corn syrup or coffee drinks made with simple syrup have one thing in common: loads of sugar. If drinks like this are part of your daily life, then you know first hand how addicting these can be. Start replacing these high-calorie, high-sugar drinks with zero calorie iced teas. Add a packet of zero-calorie stevia, made from the stevia plant, for sweetness. It’s common to have a weakness for fried foods. There’s something about the texture, taste and fat content of fried foods that sends people into an eating frenzy. To eliminate this temptation, make your own homemade versions of your favorite fried foods by baking and then turning on your oven’s high broil. For example, instead of commercially made French fries, cut a sweet potato into fries, toss with olive oil and bake at 425 degrees F for about 40 minutes, until crispy. The baked versions of your favorite fried foods have considerably fewer calories and you’re less likely to stuff yourself with them. Cookies, cakes, donuts, muffins and brownies are serious trigger foods. These are hard to avoid, since they are often shared socially at parties and celebrations. Make your own baked goods at home while replacing flour with almond flour and sugar with a touch of raw honey or stevia in the raw. These ingredient substitutions will make your baking lower in carbs and less addictive. However, keep in mind that baked goods are still baked goods and should be eaten as a treat in moderation. Eating a healthy diet, free from trigger foods, is one side of the equation when it comes to getting into amazing shape. The other side is consistent, challenging exercise. I’m here to take care of the exercise in your life. All you have to do is show up when I tell you and then give it your all for that short amount of time. Easy enough, right? You don’t need to be a chef to whip together this delicious, nutritious meal – it’s quick and easy. Organic turkey is a great source of protein. 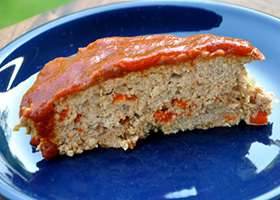 Pair this meatloaf with a fresh, green salad for the perfect, fitness-approved meal. Preheat the oven to 325 degrees F. Lightly grease a small casserole pan with olive oil. Place a skillet over medium heat, add the olive oil, garlic, onions and peppers. Sauté until soft, about 10 minutes. Remove from heat and allow to cool slightly. Add the spices, tomato paste, eggs and turkey. Mix well then transfer to the prepared pan, shaping into a loaf. Pour the ketchup evenly over the top of your loaf. Bake for 90 minutes, and until no longer pink in the center. Minimalist shoes and barefoot running may not be ideal for running. Barefoot-running enthusiasts long have believed that running without shoes or in minimalist footwear makes running easier, speedier and less injurious. But a surprisingly large number of new studies examining just how the body actually responds when we run in our birthday shoes or skimpy footwear suggest that for many people, those expectations are not being met. Consider, for instance, the findings of the most definitive of the new studies, published last month in The Journal of Applied Physiology. It looked into whether landing near the front of the foot when you run is more physiologically efficient than striking the ground first with the heel. This is a central issue in any discussion of barefoot-style running, because one of the supposed hallmarks of running shoeless or in minimalist footwear is that doing so promotes a forefoot landing. Without the heel cushioning provided by standard running shoes, barefoot proponents say, runners will gravitate naturally toward landing lightly near the balls of the feet. And they should, most proponents add, because landing near the front of the foot will require less oxygen and effort and allow you to push harder at any given speed and ultimately run faster or longer. The researchers began by outfitting all of the volunteers with the same neutral running flats and then having each run on a treadmill as he or she normally would, using his or her preferred foot strike. The volunteers ran at three different speeds, equivalent to an easy, middling and fast pace. Throughout, the researchers measured oxygen uptake, heart rates and, through mathematical calculations, the extent to which carbohydrates were providing energy. Then, in a separate experiment, they asked each runner to switch styles — the heel-strikers were to land near the balls of their feet and the forefoot strikers with their heels — while the researchers gathered the same data as before. In the end, this data showed that heel-striking was the more physiologically economical running form, by a considerable margin. Heel strikers used less oxygen to run at the same pace as forefoot strikers, and many of the forefoot strikers used less oxygen — meaning they were more economical — when they switched form to land first with their heels. Most of the runners also burned fewer carbohydrates as a percentage of their energy expenditure when they struck first with their heels. Their bodies turned to fats and other fuel sources, “sparing” the more limited stores of carbohydrates, says Allison Gruber, a postdoctoral fellow at the University of Massachusetts Amherst, who led the study. Because depleting carbohydrates results in “hitting the wall,” or abruptly sagging with fatigue, “these results tell us that people will hit the wall faster if they are running with a forefoot pattern versus a rear-foot pattern,” Dr. Gruber says. These findings undermine some of the entrenched beliefs about minimalist shoes or barefoot running, but they jibe closely with the conclusions of multiple studies presented last week at the annual meeting of the American College of Sports Medicine in Indianapolis. Five separate studies there found no significant benefits, in terms of economy, from switching to minimalist, barefoot-style footwear. The news on injury prevention and barefoot-style running is likewise sobering. Although many barefoot-style runners believe that wearing lightweight shoes or none at all toughens foot muscles, lessening the likelihood of foot-related running injuries, researchers at Brigham Young University did not find evidence of that desirable change. If foot muscles become tauter and firmer, the scientists say, people’s arches should consequently grow higher. But in a study also presented at the sports medicine meeting, they found no changes in arch height among a group of runners who donned minimalist shoes for 10 weeks. 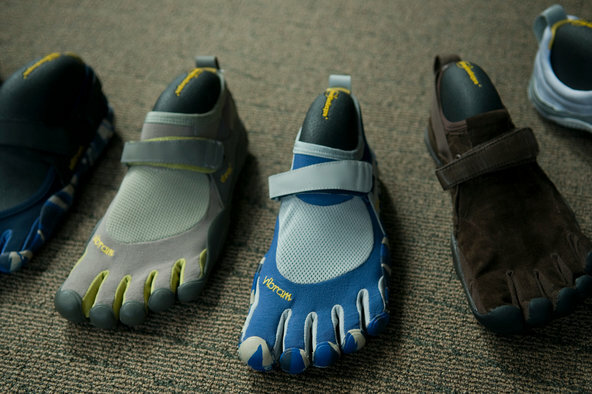 Other researchers who presented at the meeting had simply asked a group of 566 runners if they had tried barefoot-style shoes and, if so, whether they liked them. Almost a third of the runners said they had experimented with the minimalist shoes, but 32 percent of those said that they had suffered injuries that they attributed to the new footwear, and many had switched back to their previous shoes. Have you ever wondered if those minutes you spend in the gym are burning fat or just time? Unfortunately if you are like 80% of gym-goers, time is the primary thing you’re burning. I find it shocking that so many well-meaning folks are still exercising with such outdated notions of what constitutes an effective workout. I don’t want that to be you. 1) Slow and Steady Cardio Sessions: Walk into most gyms (or down on the beach bike path) and you’ll see every single piece of cardio equipment full of people in a slow, steady state of cardio. Meanwhile the free weight area is a ghost town. The idea that one should toil for hours in a steady state of low-intensity cardio in order to burn fat is the ULTIMATE outdated exercise technique. New science has clearly proven that explosions of speed and intensity are the future of fat burn. Unless you are training for a marathon, Ironman or other long distance event, long steady state cardio sessions should be avoided. Mix intervals into your cardio session. Mix in circuits to add resistance training, go run on the sand or on hills…anything that isn’t endless hours on a cardio machine, or slow running on the path! 2) Weight Machine Wandering: You’ve seen this character. He wanders among the weight machines, plops down on an open one and cranks out a set (without adjusting the weight or seat) and just as quickly as he came, he’s gone off to the next open machine. There’s no rhyme or reason, and his technique and form are way off due to his careless use of the machines. Do I even need to explain how this haphazard exercise technique burns more time than fat? I didn’t think so. Schedule a resitance workout that has purpose. Don’t use a machine just to lift, create a routine that is going to get you the rseluts that you are looking for! 3) Chronic Low Intensity: When you simply go through the motions during your workout, that’s classic low-intensity. You’re not pushing yourself with challenging weight, you’re not trying to go faster, and you’re not really breaking a sweat. Oh and, big surprise, you’re also not burning any fat. Each workout should be a challenge to go harder than the day before. If you find yourself just-going-through-the-motions then quickly pick up the pace. So what’s the secret to burning fat? A challenging routine that incorporates strength training, intervals of intense cardio and is done with intensity. Sound complicated? It doesn’t have to be. I’m here to provide you with the most cutting-edge workouts that deliver results while burning fat. A great way to avoid eating junk food is to enjoy wholesome homemade versions of your favorite processed foods. Fast food chicken nuggets are filled with MSG, sugar, gluten, sodium phosphates and other toxins, but not these healthy homemade nuggets. 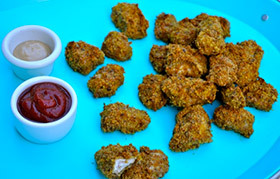 Enjoy these nuggets guilt-free! Preheat the oven to 400 degrees F. Lightly grease 2 baking sheets with olive oil. Rinse the chicken breasts and pat dry. Place between two sheets of parchment paper and pound it down to ½ inch thickness. Trim off any excess fat and cut into 2-inch strips. Cut the strips into about 80 2×2 inch nuggets. Arrange 3 shallow bowls next to your prepared baking pans. In the first bowl combine the almond flour, arrowroot starch, salt and pepper. In the second bowl combine the Dijon, eggs and olive oil. In the third bowl combine the gluten free cracker crumbs and nutritional yeast. Bake the chicken for 20 minutes, then turn the oven on high broil for about 2 minutes to get them really crispy. Serve with natural ketchup and mustard. *Freeze leftover nuggets in a freezer safe bag. To reheat place on a baking sheet at 350 degrees F for 20 minutes, or until warmed through.